What Are “Disney Featured Providers” for Scooter, Wheelchair & Stroller Rentals? And do I need to use one of them? Why an Annual Pass Can Save You Money (Even on one trip)! Is the Disney Dining Plan Worth the Money? Do you Need to Rent a Car in Orlando? Special Dietary Needs – Celiac, Allergies, etc. You are at:Home»Our Awesome Sponsors! We are not affiliated, associated, authorized, endorsed by, or in any way officially connected with The Walt Disney Company, Disney Enterprises, Inc., or any of its subsidiaries or its affiliates. The official Disney web site is available at www.disney.com. All Disney parks, attractions, lands, shows, event names, etc. are registered trademarks of The Walt Disney Company. ©Copyright 2018 Ball Media Innovations, Inc. All rights reserved. No part of this website and/or book excerpts may be copied without permission. This website, book excerpts, or parts thereof, may not be reproduced in any form without permission from the author. Links to other websites are not endorsements. 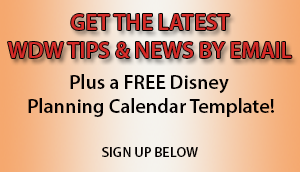 Get a FREE Disney World Trip Planning Calendar… Plus WDW News, Tips & Discounts! We hate SPAM and will not give out your info.